To Cite: Hamidian Jahromi A, Pennywell D, Owings J T. Does a Negative Emergency Celiotomy Exclude the Possibility of Significant Diaphragmatic Injury? A Case Report and Review of the Literature, Trauma Mon. 2016 ; 21(4):e25053. doi: 10.5812/traumamon.25053. Introduction: Diaphragmatic rupture (DR) is an uncommon, potentially serious complication following blunt or penetrating abdominal trauma. Even with a high index of suspicion, the diagnosis of DR can easily be missed for a long period post injury. Delayed or missed diagnosis [delayed diagnosis of diaphragmatic rupture (DDDR)] and delayed diaphragmatic rupture (DDR) are possible explanations in cases where the initial operative exploration fails to show the diaphragmatic damage. Case Presentation: Here we present a patient with suspected DR that was not seen on initial open abdominal exploration, but was suggested by subsequent serial imaging. This injury was ultimately identified on laparoscopic exploration. The procedure was converted to open (celiotomy) due to poor tolerance of the pneumoperitoneum required for laparoscopy, and the laceration was primarily repaired. We propose that DDR and DDDR be considered as a differential diagnosis in patients with a previous thoraco-abdominal trauma when presenting with radiologic/clinical signs suspicious for DR, even when the immediate post traumatic exploration failed to demonstrate a DR. Conclusions: A high index of suspicion is essential for early detection of DDR and DDDR. Patients with high impact injuries or surrounding organ damage should be followed with serial clinical examinations, follow-up radiologic assessments, and even re-exploration in situations highly suspicious for diaphragmatic injuries. Diaphragmatic rupture (DR) is an uncommon, potentially serious complication following blunt or penetrating abdominal trauma (1). Even with a high index of suspicion, the diagnosis of DR is challenging and can be missed for a long period following injury. Although delayed / missed diagnosis is the most probable explanation [delayed diagnosis of diaphragmatic rupture (DDDR)] in the majority of the cases with a previous history of thoraco-abdominal trauma who present later with such injuries (damaged diaphragm), delayed diaphragmatic rupture (DDR) (in situations where the initial chest/abdominal exploration has confirmed an intact diaphragm) is another possibility and has been reported before (2-4). DR may remain occult acutely and consequently the clinical presentation may be delayed from 1 day to 50 years post trauma (4). The spectrum of manifestations range from an asymptomatic abnormal radiographic findings to obstructive symptoms due to incarcerated organs, melena, hematemesis, tension feco-pneumothorax, hemodynamic instability, respiratory distress or even death (4). Our case was an 11-year-old white male who presented to our emergency department after a high-speed motor vehicle collision with a Glasgow coma scale score of 5. On arrival, the patient was intubated and was hemodynamically unstable. He had a large scalp laceration that was not actively bleeding. FAST examination was negative for free fluid, but the orientation of the spleen was felt by the radiologist to be unusual and the possibility of a splenic injury could not be ruled out. Chest x-ray was concerning for an acute, traumatic DR. The massive transfusion protocol (MTP) was activated and the patient was taken urgently to the operating room for an exploratory celiotomy. There was no significant blood in the abdomen and the stomach and other upper abdominal organs were found to be within the abdomen. The spleen was not injured. The diaphragm was examined and no gross defect/injury was seen (peritoneum was intact in all directions), although the diaphragm did appear to be thin and stretched out (elevated). Postoperatively the patient underwent CT imaging that was concerning for diaphragmatic rupture (Figure 1), but due to the patient’s severe head injury he was deemed too unstable for re-exploration from a neurosurgical standpoint. As his neurological status began to stabilize, as demonstrated by his ICP measurements, imaging was repeated and was again felt to be conclusive for diaphragmatic rupture (Figure 2). The patient was then returned to the operating room where laparoscopic examination of the diaphragm revealed a 4.5 cm laceration in the diaphragm from the 11 o’clock position, at the diaphragmatic crura adjacent to the esophagus and extending towards the central tendon with herniation of a portion of the stomach into the chest (Figure 3). 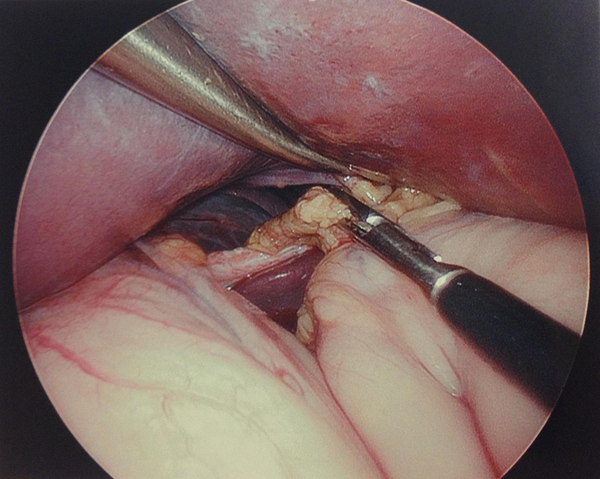 The procedure was converted to open due to poor tolerance of the pneumoperitoneum required for laparoscopy, and the laceration was primarily repaired. Figure 2. Non-enhanced computed tomography (NECT) prior to a second exploratory laparotomy. 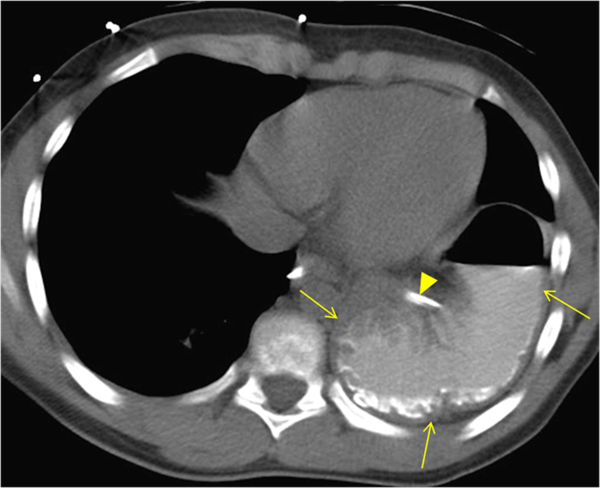 Axial image in the base of the thorax confirms gastric herniation (arrows). The herniated stomach is distended with oral positive contrast and the NG tube is partially visualized (arrowhead). Mild gastric wall thickening is present suggesting mural inflammation. The possibility that we may have missed a small diaphragmatic injury that later expanded to a detectable size (DDDR) or that a delayed diaphragmatic rupture (DDR) could have actually happened in this patient is a matter of speculation. Regardless of such possibilities (DDR versus DDDR), our case is an example that even a negative initial exploratory celiotomy in an injured patient does not rule out the possibility of a delayed DR. In general, patients with diaphragmatic rupture, especially following a blunt trauma, have other concurrent injuries (such as splenic rupture, rib fractures or hollow viscus rupture) due to the high energy dissipation required to rupture the diaphragm. Diaphragmatic damage may be caused by a direct injury, an increased trans-diaphragmatic pressure gradient, shearing and avulsion forces transmitted by the internal viscera to this stretched musculo-tendonous organ (diaphragm), or it may be related to immediate devitalization with delayed ischemia or necrosis of the muscular segment of the diaphragm (DDR). This may lead to secondary inflammatory changes (and potentially infection) in the adjacent organs (i.e. lower lung fields) (4). During this process, continuous increased pressure in the thoracic and or abdominal cavity (e.g., extubation, intubation, cough, mechanical ventilation, intra-abdominal hypertension) may also precipitate the damage process. While the presence of the liver under the right diaphragm, along with the general congenital strength of the right diaphragm compared with the left side may have a protective effect in preventing the diaphragmatic rupture, it also makes the detection of a right side DR more challenging. Right side diaphragm involvement along with the presence of hemorrhagic shock and other signs of physical decompression on presentation are poor prognostic signs for mortality and morbidity in cases with DR (4, 5). Radiologic evaluations with serial upright chest x-ray and multi-detector computed tomography (MDCT) (95% accuracy) are highly accurate; however, due to potential diagnostic pitfalls, such as anatomical variants and congenital and acquired abnormalities, these radiologic tests are still far from being an ideal diagnostic test (6, 7). Exploratory laparotomy/thoracotomy and thoracoscopic/laparascopic evaluation with meticulous examination of both hemi-diaphragms are the gold standard for diaphragmatic evaluation following blunt and or penetrating trauma. Presentation/diagnosis of the DR (blunt traumatic diaphragmatic hernia) can be delayed for long periods (between 2-26 years in some reports) (8). Even with a thorough evaluation (DDDR is always a possibility), delayed DR may form following the initial exploration. This is especially true if on initial inspection there appears to be signs of diaphragmatic eventration. This may indicate an intact peritoneal surface with underlying avulsion of the diaphragm from its attachments to the chest wall. While laparoscopic evaluation in cases where laparoscopy is not contraindicated seems to be an ideal option for diagnosing the DR (the positive intra-abdominal pressure make herniation of the intra-abdominal viscera and the diaphragmatic defect easier to detect) and there are reports for successful repair of small diaphragmatic defects via laparoscopic approach (9), an open approach, using celiotomy or thoracotomy, is still preferred by most surgeons for repair of large diaphragmatic defects, especially in the presence of concurrent intra-abdominal damages or in hemodynamically unstable patients. We propose that DDDR and DDR be considered as a differential diagnosis in patients with a previous thoraco-abdominal trauma who manifest radiologic and or clinical signs suspicious for DR, even when the immediate post traumatic exploration has showed a normal appearing diaphragm. We must inform the patients of this possible complication post trauma and educate them about possible signs and symptoms. While high index of suspicion is essential for early detection of DDR, patients with high impact injuries or surrounding organs damage should be followed with serial clinical examinations and follow-up radiologic assessments. There should be a low threshold for performing or repeating exploratory procedures (i.e., celiotomy, laparoscopy, thoracotomy, and or thoracoscopy) when cases are highly suspicious for diaphragmatic injuries. The authors would like to thank Ms. Talicia Tarver who provided us editorial assistance, Dr. Guillermo Sangster for his help in preparation of the radiologic images, and Dr. Kevin Boykin for critical review of our paper.